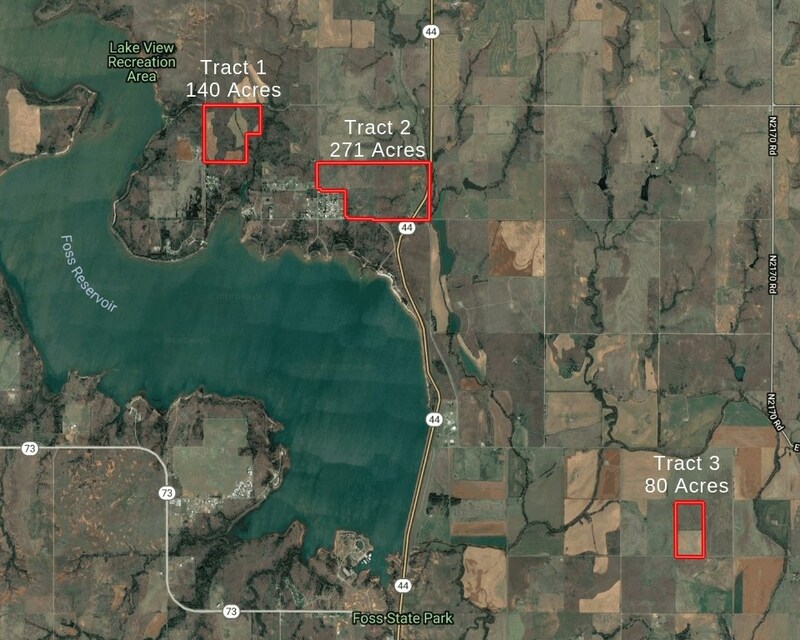 This Oklahoma hunting and ranch land with Foss Lake view building home sites in Custer County, Oklahoma will be sold in multiple tracts at auction on Thursday, April 25, 2019, 10:25 am at the Butler Community Center, 415 E Broadway St., Butler, OK 73625. Tract #1 consists of ±140 acres with prime Oklahoma hunting and recreational land in Custer County. The hunting consists of white-tail deer, turkey, quail, and goose. The land is bordered on the east and south sides by state land. This tract contains rolling terrain with extensive coverage for wildlife. There is approximately 70 acres of cultivated ground or food plots and the balance is in native grass. This tract also has multiple Foss Lake view home sites. This tract has a water well and hard surfaced road on north and west sides. Tract #2 has approximately 270 acres in Custer County, Oklahoma and will be sold in multiple acreage combinations from approximately 40 to 160 acres in size. This tract consists of mainly native grass and has multiple Foss Lake view homesites with potential homesite development. This property also has deer and quail hunting. Tract #2 is bordered on three sides by hard surfaced roads and OK Highway 44 frontage on the east side. This tract also contains a small home with multiple outbuildings. Tract #3 consists of ±80 acres with 34 acres being cultivated ground and the balance in native grass. The property is approximately 2.5 miles east of Foss Lake dam with hard surfaced road frontage. This 80-acre tract would make a beautiful home-site or would be a great addition to your farm and ranch operation. ±500 acres of hunting and ranch land in Custer County, Oklahoma with Foss Lake view building sites will be sold at auction on Thursday, April 25, 2019, 10:25 am at the Butler Community Center, 415 E Broadway St., Butler, OK 73625. Minerals: Selling surface rights only. Auction will be held off-site at the Butler Community Center, 415 E Broadway St., Butler, OK 73625. Check Out Dates - 10% of purchase price to be placed in escrow day of sale. Balance of purchase price to be due and payable in 45 days or upon acceptance of title. All taxes will be prorated to day of closing. Possession of Tracts 1 & 2 will be delivered to Buyer at Closing. Possession of Tract 3 will be given after harvest. Auction Notice - A 10% buyer’s premium will be added to the bid price. The contract price will be equal to the bid price plus the Buyer’s Premium. This is a simulcast auction. All bidding will take place live and online.